Hong Kong, Hong Kong University Press, 2016, 234 p.
Stefan Al, professor of urban design at the University of Pennsylvania, presents a third collection discussing a facet of China’s urban development. In 2012, he focused on southern China’s factory towns, and in 2014 he wrote about urban villages in the same region. This new publication is concerned with commercial centres, especially in the case of the Hong Kong Special Administrative Region. As the title indicates, Hong Kong is often seen as the quintessential urban object of commercial centres, often labelled “mall city.” These numerous malls are thus “dreamworlds of consumption” marking space in Hong Kong as a part of its social life. Hong Kong holds the world record for the highest commercial density, with one mall per square mile or 5,606 square metres per square kilometre. Only Singapore comes somewhere close with 4,023 square metres per square kilometre, while Holland is at a very distant third with 52 square metres. Hong Kong is thus often held up as Asia’s Shopping Paradise, trade taking pride of place in the economy. The sector employs one in four people (compared with one in nine in New York) and supports a property sector in quasi-permanent growth, with commercial rents being among the world’s highest. Malls are not the only urban objects symbolising Hong Kong. Skyscrapers – 1,309 of them – stand out: double the number in New York. In most instances, towers and malls go together, their development being concomitant. In residential areas of the New Territories, malls are clubbed with towers and mass transit stations. On Hong Kong Island and in Kowloon they’re often found under office blocks and hotels. In this cross-fertilisation, the mall offers several entrees, with buildings that could serve as private podiums to skyscrapers. The latter impart to the malls a quasi-iconic visibility for residents, who are also potential clients. 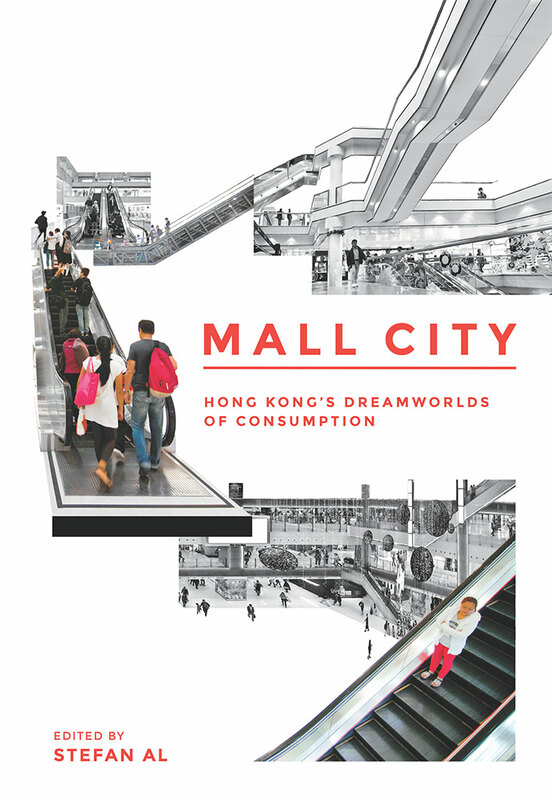 The book is thus concerned with this urban object associating commercial, residential, and office activities in an ecosystem called “Mall-Oriented Complex” or “mall city.” The mall has thus emerged as the basic unit of urban development, where Hong Kong residents may live, work, consume, and seek entertainment, all next to a mass transit station. These Mall-Oriented Complexes thus highlight the power of consumption culture in Hong Kong society, as well as the complexity of relations between the public and private spheres, especially from the point of view of public spaces. The book is organised in two parts. It is backed by a superb layout of numerous photographs, maps, and especially 3-D drawings that help the reader better appreciate the dimensions of buildings, their designs, and their urban integration. Part I presents a series of essays dealing with different disciplines and examining how the malls have become what they are today, what they represent for Hong Kong residents, and what can be learned from their development. Starting off, Barrie Shelton explains Hong Kong’s predisposition to becoming a “mall city,” using a historic approach that helps advance different urban typologies associated with density and diversity. In the second essay, David Grahame Shane retraces the historic evolution of Hong Kong malls, noting the international influences, starting with major nineteenth century European shops and then the Japanese shops located above railway stations and the advent of hybrid mega-structures in the contemporary period. Tung-Yiu Stan Lai focuses on the vertical dimension of the malls, from the podiums that form the bases to the towers. He explores the various challenges they pose, especially relying on the case of Langham Place in Mongkok. Carolyn Cartier explores the impact of these new developments on the localities’ urban and social structures. She explains how they have become actors in the gentrification process, leading to increases in rents and transforming public, industrial, and heritage spaces into those devoted essentially to consumption, which are out of sync with the popular localities that preceded these developments. Against the grain of these gentrifying phenomena, Gordon Matthews presents the case of Chungking Mansions: the building incarnates the globalisation process, with a concentration of traders and clients from South Asia and Africa, who go there for inexpensive restaurants, guest houses, mobile phones, and other electronic goods. Cecilia L. Chu deals with the quite prevalent view of malls being commercial spaces that reduce local communitarian life. She brings out the diversity of activities taking place in these spaces (billiards, bowling, skating, fountains, etc.) and points to instances of new cities whose residents have developed a feeling of belonging to the malls. Of course, recent evolutions such as an exponential growth in less accessible commerce have led to complaints from residents who oppose these changes. In the last essay, Jonathan D. Solomon considers the malls’ “anti-urban” reputation. He compares two recently developed “mall city” structures that are quite similar at first glance: Union Square, with its Elements, which despite being connected to the airport link metro line has little local interaction; and the International Finance Centre (IFC), which he deems a global village connected to all modes of transport, and which benefits from numerous local interactions, notably with links to elevated walkways. Part II presents a catalogue of malls. It starts off with a discussion of key concepts such as atriums, corridors, vertical movements (lifts and especially escalators), and activities other than consumption, each illustrated with a great supporting cast of photographs. This part ends with cartographic and graphic representations in map and section format of some of the city’s major malls. Next a typology of malls is presented through some iconic examples. Chungking Mansions represents the “residential/commercial” type, and the “Mall/residential” type is exemplified by the Golden Shopping Centre, Tuen Mun Town Plaza, Lok Fu Plaza and Citywalk. The third type is the “Mall/bureau,” represented by Sino Centre, Argyle Centre, Shun Tak Centre, and Times Square. Finally there is the hybrid type – Harbour City, Cityplaza, Pacific Place, IFC, Elements, Megabox, and Langham Place. Hong Kong’s malls make for a unique case (only Singapore’s being comparable) and are quite removed from the traditional representation of Western malls, especially American, that are associated with urban sprawl and the city’s mono-functionality. At a time when many American and more generally Western malls are facing financial difficulties, Hong Kong’s experience helps trace some challenges facing these contemporary urban objects by offering a marked counterpoint through an urban strategy marrying high density, accessibility to transport hubs, and diversity of urban functions. This book will delight specialist scholars as well as current and future town planners, who would find in it matters for reflection and comparison on the evolution of key elements in the urban development of Hong Kong and beyond. Those interested more in Hong Kong and China than in the making of cities will find in the book keys to understanding the city spaces and sociabilities associated with them and to examining a model that is a major source of inspiration for urban development in mainland China. Nicolas Douay is associate professor of urban planning at the Université Paris Diderot (nicolas.douay@gmail.com).